In the news today, things are anything but certain, so how can we know and learn to trust the God Who never changes, even in changing and uncertain times? God has never changed. God cannot become any better or change His mind or learn anything new. God is omniscient, knowing everything there is to know. On the other hand, humans change all the time, and today, as in every day, the times are constantly changing. Some churches fit their teachings and doctrine to the times in which we live, but if anything needs to be changed, it is certainly not God or the teachings of the Bible. The Word of God is just as true today as in the day it was written. Even so, some denominations have watered down the truth in order to be more acceptable to the world, but what they are doing is bowing to the god of pragmatism. Pragmatism is a philosophical movement which claims that an ideology or proposition is true, only if it works satisfactorily, so unpractical ideas are to be rejected, and for many, preaching repentance and faith offends too many people and they just are willing to do that. No one wants to hear “You’re a sinner and need Christ.” They’d rather hear “God loves you just as you are,” but the gospel that Jesus Christ brought was the gospel of repentance and faith (Mark 1:14-15). Jesus didn’t try to change it to fit the crowds of His day….it is the crowds that must change. The message of faith is nothing new. Abraham believed God (Gen 15:6), and it was accounted to him as righteousness (Rom 4:3; Gal 3:6), and so it is for those who trust in Christ. They believe God and His Word, and the Word of God says that Jesus is the Son of God Who gave His life as a ransom for many (Mark 10:45). That will always be true, regardless. I know a lot of my friends from our high school reunion, and wow, they have changed, but so have I! I still know most of them at first glance, but for some, it’s harder for me to know who they are because they’ve changed so much, but one thing that doesn’t change is God. Malachi the Prophet wrote, “For I the Lord do not change; therefore you, O children of Jacob, are not consumed” (Mal 3:6) and aren’t we glad God doesn’t change His mind? What if God finally gave up on Israel and they would never be restored to the land as Isaiah the Prophet wrote about? What if He changed His mind about saving us, or sending Jesus, or ending suffering (Rev 21:4)? Everyone else might change, including changing their minds, but God never will. I believe the reason God said, “I the Lord do not change; therefore you, O children of Jacob, are not consumed” (Mal 3:6), is because God was showing He was faithful to His promise, including the one to Abraham. He keeps every one of His promises and never has any promise of God ever failed, one time. How are we different from God? Moses wrote that “God is not man, that he should lie, or a son of man, that he should change his mind. Has he said, and will he not do it? Or has he spoken, and will he not fulfill it” (Num 23:19)? Again, we should rejoice at the constancy of God during turbulent and changing times. Times are changing, but I am convinced they are not changing for the better, but thankfully, God is and always will be the same, and there’s comfort in knowing that, and even “if we are faithless, he remains faithful — for he cannot deny himself” (2nd Tim 2:13). We have a wildlife refuge nearby where all the wildlife can come and live and not worry about being shot. It’s a place of protection for them. They are free to raise families and can come and go when they like, but God is more than this type of a refuge, and even though you will find a place of rest and shelter, it is God’s promise that “he will deliver you from the snare of the fowler and from the deadly pestilence” (Psalm 91:3), and “will cover you with his pinions, and under his wings you will find refuge; his faithfulness is a shield and buckle” (Psalm 91:4). It’s apparent that the psalmist had been through some dangerous times, because he writes, “You will not fear the terror of the night, nor the arrow that flies by day, nor the pestilence that stalks in darkness, nor the destruction that wastes at noonday” (Psalm 91:5-6), so even though you might see terror and warfare during the day and night (like on the news), God says that we should not fear, “the pestilence that stalks in darkness, nor the destruction that wastes at noonday. Even if A thousand may fall at your side, ten thousand at your right hand…it will not come near you. You will only look with your eyes and see the recompense of the wicked.” (Psalm 91:7-8). That’s because “you have made the Lord your dwelling place — the Most High, who is my refuge — no evil shall be allowed to befall you, no plague come near your tent” (Psalm 91:9-10). The point to all this is when you see things falling apart in the world with things like violence and natural catastrophes, you can know that God never changes, and the promises made to His children are set and cannot be changed. 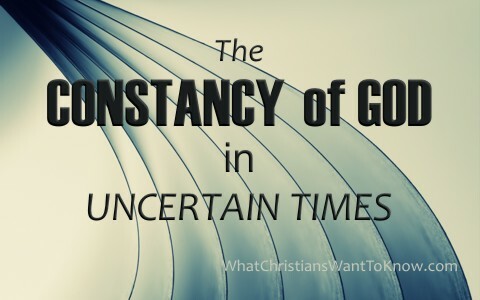 In the news today, things are anything but certain, so how can we know and learn to trust the God Who never changes, even in changing and uncertain times? I would say stay in the Word. When you put yourself in the Word of God, the Word of God gives you an anchor for your soul. As the world grows into an increasingly dangerous place to live, we can rest in the assurance of what God gives every child of His, and the Apostle Paul reminds us: “that neither death nor life, nor angels nor rulers, nor things present nor things to come, nor powers, nor height nor depth, nor anything else in all creation, will be able to separate us from the love of God in Christ Jesus our Lord” (Rom 8:38-39). That verse is still true and it will always be true, because God does not change, even in the changing times we live in, and that’s good, because Jesus came to die for sinners, and to rescue those who had the wrath of God abiding on them (John 3:36b), and I, for one, am glad He didn’t change his mind about that…or about me. Next post: How Can Christians Help Alcoholics?